If you like the idea of fresh, easy homemade bread but don’t want to break the budget on a machine, this bread machine has a value price tag, but still has plenty of features. This can make loaves up to two pounds and has 12 bread setting and three crust settings so you can make a variety of breads, knead your dough, or make jam. If you’re in a hurry, the Expressbake feature can produce a finished loaf in under an hour. This has a large LCD display that shows how the bread making is progressing. A 13-hour delay timer allows you to add ingredients and bake later. A keep-warm setting will keep the loaf warm for you. This includes a measuring cup and spoon. If you want a little variety, this bread machine has settings for three different loaf sizes, up to a whopping 2 1/2 pounds. 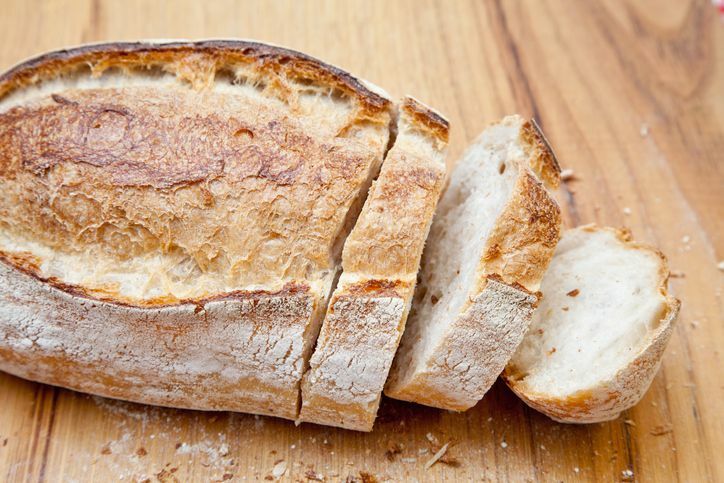 There are settings for white bread, whole wheat bread, multigrain bread, French bread, and quick breads and cakes. A beep lets you know when it is the proper time to add raisins, seeds, nuts, or other add-ins, but there’s no dispenser for these ingredients. A rapid bake setting produces a loaf quickly, and a no-bake feature lets you use the machine for kneading only, so you can form and bake bread or buns and then bake them in your oven instead. This machine has a yeast dispenser, so the yeast is added at exactly the right time, and there’s a 13-hour delay timer so you can delay the baking time to fit your schedule. There’s no window in this machine so you can’t see the loaf in progress, but this reflects heat inside the unit for more even baking. If there’s a power outage of less than 10 minutes, the baking will resume when power returns. A well-known brand with a good reputation, this bread maker does everything you need, plus a little more. It bakes a rectangular 2-pound loaf and also has settings for baking gluten free bread as well as a setting for breads using organic ingredients and custom settings so you can bake bread exactly the way you want it. There’s a large window so you can check the progress of the bread as well. This machine has two kneading paddles that make sure the dough is completely kneaded with no bits of flour left unmixed, a rapid option for times when you need to have the bread done faster, and a 13-hour delay timer. You can choose a light, medium or dark crust, and the preprogrammed settings are for basic bread, basic wheat bread, basic dough, quick bread, quick wheat bread, quick dough, jam, cake, sourdough starter, and homemade recipes. 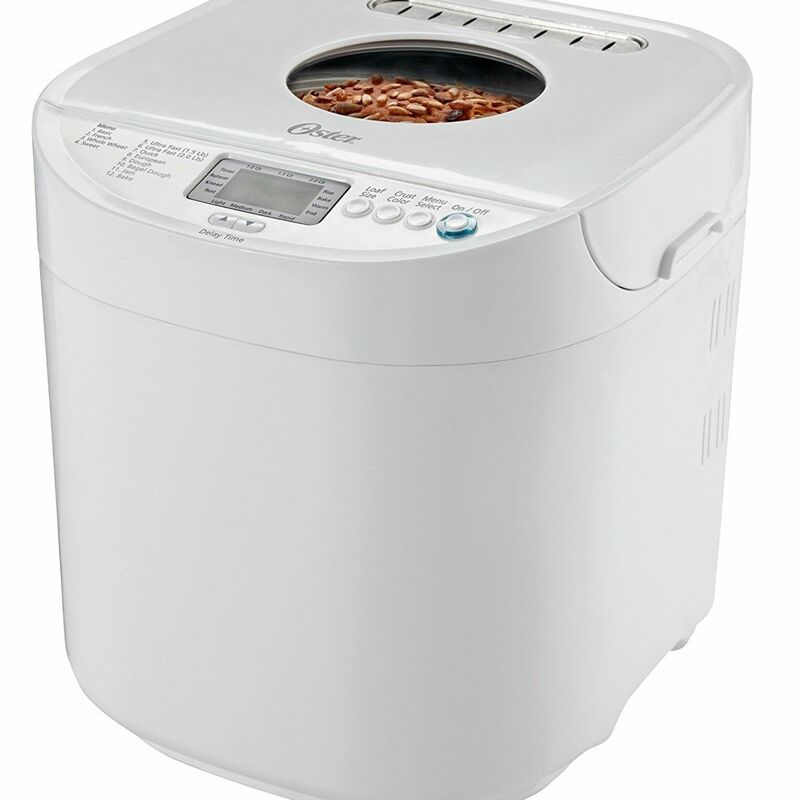 This is a high-end machine, with a price to match, so it might not be the best option for novices who aren’t sure how often they’ll use their bread maker. This bread maker has 14 baking functions: white, white rapid, whole wheat, whole wheat rapid, French, French rapid, sweet bread, quick bread, low carb, gluten free, dough, artisan dough, jam, and bake only. You can set the crust for light, medium, or dark, and it makes loaves in 1-, 1 1/2- and 2-pound sizes. There is a 15-hour delayed start option so you can add ingredients and bake later, and there is a 1-hour keep warm option. A top window lets you check the process without lifting the lid. If those options aren’t enough, you can also adjust the settings to your liking. The machine has collapsible kneading paddles, so you won’t have big holes in the finished loaf, and it makes it easier to remove the loaf from the pan. A fruit and nut dispenser lets you add ingredients towards the end of the kneading process. This includes a collapsible measuring cup, an adjustable measuring spoon, and a recipe book. With 12-settings that can handle French, quick bread (no yeast), sweet, 1.5-lb express, 2-lb express, dough, jam, cake, whole grain, gluten free and bake and an audible reminder for adding fruits and nuts you know this gets the job done. Besides turning out your favorite breads it can also make pizza dough, cakes, jams, flatbreads and croissants making it a star in your kitchen. You can also choose a light, medium or dark crust setting and all of this can be done with a delayed timer so you can make sure when you walk in the door you have a fresh hot loaf of bread waiting for you. While most new bread makers have one gluten-free setting, this one offers three options for gluten-free breads: gluten-free salty, gluten-free sweet, and gluten-free cake. But that doesn’t mean it’s only for gluten-free baking, it also has settings for rapid whole wheat, whole wheat, salt-free, super rapid, rapid sweet bread, French bread, sweet bread, cooking, dough only, cake, jam, and pasta dough. It makes bread in three sizes, up to 2 pounds, and has three crust darkness settings. A delayed start for up to 15 hours means you can have bread ready when you want it. It automatically keeps the bread warm after baking for up to one hour and there’s a window so you can check the progress of the bread. Be forewarned, reviewers report that the manual for this model has some errors, so recipes may need to be tweaked to get the best results. Convection cooking provides even baking in this breadmaker, whether you choose 1-, 1 1/2- or 2-pound loaves. An audible tone let you add mix-ins at exactly the right time, and another tone lets you remove the finished dough to shape it by hand for the final bake with the paddles removed. The pause button stops the cycle so you can take your time hand shaping the dough, and a delay option lets you schedule the bread up to 12 hours in advance. In case of a power outage, the breadmaker can wait up to 15 minutes and continue working when power is restored. The controls are easy to use, with a 16-item menu that automatically adjusts the kneading, rising, and baking times to perfectly bake a variety of breads, doughs and more. You can choose from pizza dough to sweet breads to cakes to jams, and you can choose a light, medium or dark crust for your loaf. A rapid cycle shortens the time, while the “last minute loaf” option speeds the process even more. This works well and looks good on the counter, with a sleek brushed stainless steel surface, embossed logo and large, sturdy handles. A window lets you peek at the bread during the process and LED indicators let you follow the process. The lid is removable for cleaning. Great for singles, couples, or families who don’t want large loaves of bread, this slim bread maker fits in smaller spaces and makes a 1-pound loaf, yet it still has features you look for in a quality machine. This has a viewing window so you can check the loaf, and an easy-to-read LCD control panel and a programmable timer that can delay baking for up to 13 hours. Menu settings include basic bread (regular, or firm), soft bread, French bread, bread dough, cookie/pasta dough, cake, jam and quick baking. The crust can be set for regular or light, and the quick baking setting produces a loaf of bread in less than two hours. Our reviewers spent 10 hours testing one of our readers’ favorite bread machines. To give the most thorough feedback possible, our testers made a number of different kinds of bread. We asked them to consider the most important features when using this bread machine, including their thread count, softness, and durability. We've outlined the key takeaways here so that you, too, know what to look for when shopping. Loaf capacity Think about how many people you want to feed with your newly made loaf and consider a size that you can finish before it goes stale. Many bread machines have settings for multiple loaf sizes, but the maximum size varies from machine to machine. Extra features Today’s bread machines come loaded with features, which can be fun to test, but a machine with too many features could be too complicated for your needs. Are you interested in trying different styles of bread, or will you just be making sandwich loaves every week? Gluten-free settings While many bread machines offer gluten-free settings, look for one that puts a priority on that function if you’re going to be focusing on gluten-free breads. If you will dabble in gluten-free baking, make sure you clean every nook and cranny of the baking chamber to remove leftover gluten residue. One reviewer, who made everything from a quick bread to a cinnamon raisin bread with this machine, raved that the bread’s quality was “like a store-bought white bread” and that the “instructions were easy to understand.” Cleaning was also painless: “Both the paddle and the pan have a nonstick finish so it was barely any work to clean them,” reported one tester. The one thing reviewers weren’t a fan of was the machine’s large size.